Last week at the Law Society, prominent human rights lawyers and activists Olga Sadovskaya, Stephania Kulayeva and Khalid Bagirov spoke candidly about the difficulties faced by lawyers working in Russia and Azerbaijan, in light of recent legislative changes in their countries which limit the scope of civil society to operate. The panel discussion, Human Rights Defenders Under Pressure, gave a voice to those at the front line of defending human rights. Such events are important for raising awareness of key human rights issues, and I hope we can continue to support the lawyers in Russia and Azerbaijan in the future. Olga Sadovskaya (Committee Against Torture) and Stephania Kulayeva (Anti-Discrimination Centre Memorial) both represent NGOs which have found themselves on the so-called ‘Foreign Agents’ list. They explained that the term ‘foreign agent’ has been inextricably linked with spies and illicit activities since the Soviet era; the law effectively acts as a smear campaign orchestrated by the government and the State-controlled media. The historical significance of the term makes it very difficult for civil society to maintain support from the very public which it is seeking to protect. Moreover, for some NGOs, the law has meant a daily battle to overcome obstacles such as fines, legal action and, since 28 October 2015, the threat of liquidation by law enforcement agencies The new law on ‘undesirable’ organisations, signed in May 2015, is yet another step towards limiting NGOs’ ability to operate, as it will make it illegal to cooperate with and receive foreign funding from foreign organisations designated as “undesirable”. Our third speaker, Khalid Bagirov, a high-profile human rights lawyer from Baku, is currently representing Rasul Jafarov, Leyla & Arif Yunus, and a number of other critical voices who have been imprisoned as a result of the most recent crackdown on civil society in Azerbaijan. He explained how Azerbaijan has arrived at a situation where it has 80 political prisoners, including journalists, bloggers, lawyers and activists currently languishing in prison. There remain only 900 practising criminal lawyers for a population of 9 million, only four or five of whom dare to defend political prisoners. Yet, as Khalid noted, Azerbaijan is still a member of the Council of Europe. For many the lack of overt criticism from the latter and from European democracies serves as a silent endorsement of the current regime. The tenacity of our panellists highlights the integral role played by human rights defenders in safeguarding the most basic freedoms. Lawyers in countries such as Russia and Azerbaijan face unprecedented obstacles in their professional and personal lives. It is essential to raise awareness of the issues discussed during this event amongst the legal community if we are to support our colleagues on an international scale. Sobering though the panel discussion proved for many of the audience, it sparked a lively discussion over the implications of scrapping or watering down the UK Human Rights Act. The panellists unanimously emphasised that such a move would present a chance for oppressive regimes in Europe, such as those in Russia and Azerbaijan, to withdraw from their international human rights commitments, which would inevitably have a detrimental consequences for millions of the most vulnerable people on the continent. With thanks to Masha Karp for interpreting on behalf of Khalid Bagirov, and to the Law Society for generously hosting the event. Thanks also to Tony Fisher, of the Law Society’s Human Rights Committee, for chairing the evening’s discussion. 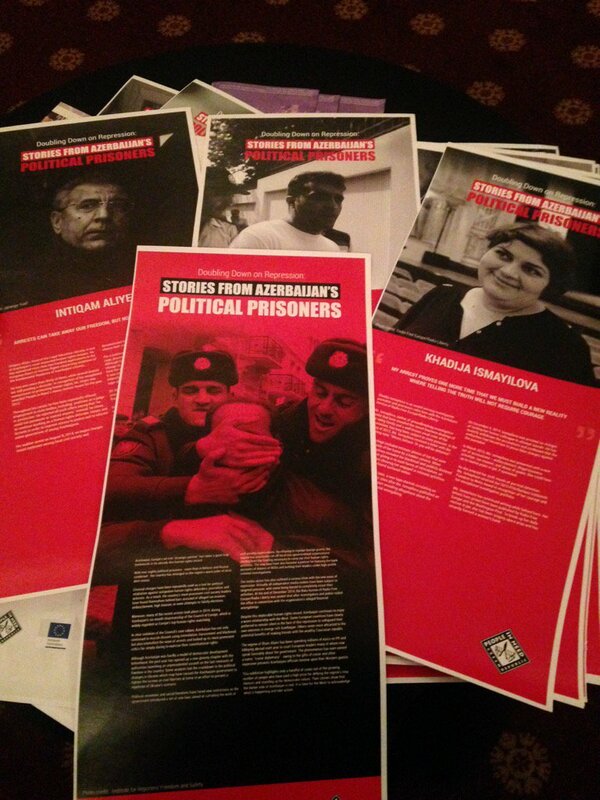 People in Need, a Czech NGO, provided artwork from two of their recent exhibitions: Stories without Endings: Violence and Impunity in the North Caucasus and Doubling Down on Repression: Stories from Azerbaijan’s Prisoners. EHRAC and Memorial HRC (Moscow) are representing a number of NGOs in their application to the European Court of Human Rights, in which they argue that the law violates their rights to freedom of expression and association (Art. 10 and 11 respectively of the European Convention on Human Rights). The applicant NGOs include Memorial HRC itself, as well as Committee Against Torture and Citizens’ Watch.